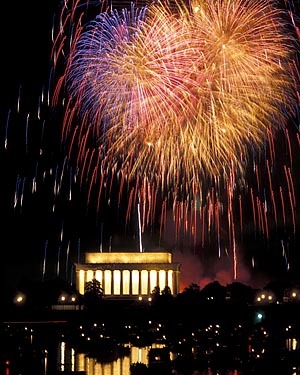 Everyone loves to take fireworks photos. But how do you get an image with several burst's and a proper exposure? It really isn't difficult. 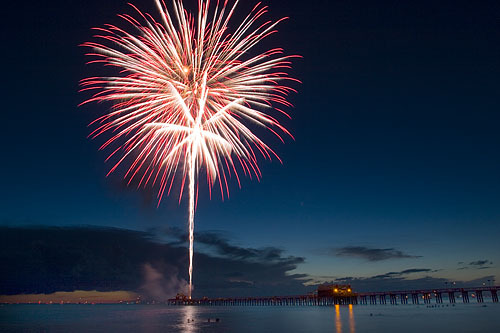 Even though it is obviously dark at night, the fireworks themselves are extremely bright and a low ASA/ISO film or setting on your digital camera is sufficient. I usually use an ASA/ISO of 100 with an aperture of f/11 and a total exposure time of around 8-9 seconds. Anything more than that and your fireworks photos will be "burnt out" or too bright with no color and just a white blast. If possible, I try to find a nice foreground or background to put the fireworks in perspective by adding a little interest and local identity to the final image. You can see a few examples of this in the photos below. It's best to use a tripod and the technique I like to use is to set my camera exposure at ASA/ISO 100, at f/11 and the shutter set on "bulb". If "bulb" is not available, then set your camera for the longest shutter available. Once I see the rockets go up, I'll open the shutter until I see the exploding fireworks and then I will either use a piece of cardboard or even my hand to cover the front of the lens. This essentially stops the exposure until the next blast. Then I'll wait until another rocket goes up and right before the explosion I'll remove my hand to allow an additional fireworks image to expose on the same frame. Two or three is usually enough without causing over-exposure. Close the shutter and advance to the next frame and try again. By covering and un-covering the lens, you should end up with a "total" exposure time of around 8 seconds. You'll get use to the timing. Note: Don't touch or move the camera when covering and un-covering. You don't want to jar the camera position. When you're able to find a foreground object, like in the images below, you must expose for that object. Take a direct exposure of the subject, the Capitol Building for example, and adjust your exposure for f/11 at whatever shutter speed is determined. That is your final exposure. 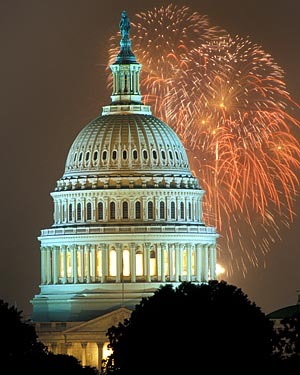 The fireworks will be sufficiently exposed at the f/11 setting and the Capitol will expose at whatever shutter reading you came up with. The two images will have a balanced exposure. Experiment...you'll have alot of variations to choose from.